One cup contains 40 calories and 3 g of dietary fiber. Strawberries are also good sources of vitamin C and B9 as well as minerals. Strawberries contain phenolic acid which helps regulate blood sugar levels. Strawberries are good sources of antioxidants which prevent diseases like atherosclerosis which is hardening of arteries that leads to heart disease. 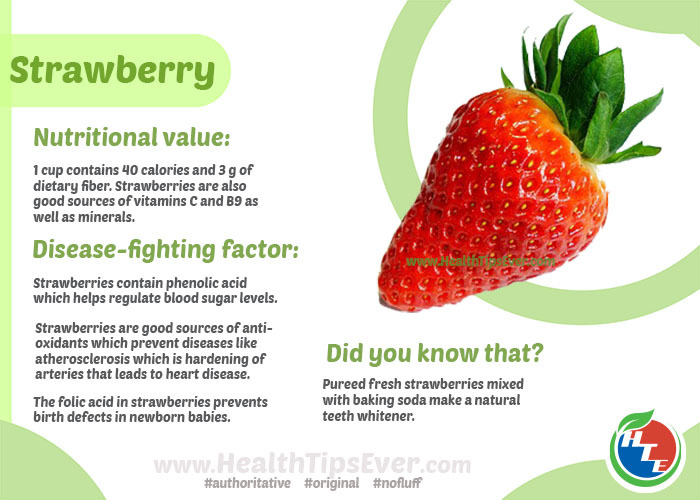 The folic acid in strawberries prevents birth defects in newborn babies. Pureed fresh strawberries mixed with baking soda make a natural teeth whitener.